Researchers of Karlsruhe Institute of Technology (KIT) have unveiled an important step in the conversion of light into storable energy: Together with scientists of the Fritz Haber Institute in Berlin and the Aalto University in Helsinki/Finland, they studied the formation of so-called polarons in zinc oxide. The pseudoparticles travel through the photoactive material until they are converted into electrical or chemical energy at an interface. Their findings that are of relevance to photovoltaics among others are now published in the renowned journal Nature Communications. Processes converting light into storable energy may contribute decisively to a sustainable energy supply. For billions of years, nature has been using such processes for photosynthesis to form carbohydrates with the help of light. In research, phototcatalysis that uses light to accelerate chemical processes is gaining importance. In the past years, researchers also achieved considerable progress in photovoltaics converting incident sunlight directly into electrical energy. Efficiency constantly improved. However, the processes underlying photovoltaics have hardly been studied in detail so far. "Conversion of photons, i.e. light particles, into electricity takes several steps," Professor Christof Wöll, Head of the Institute of Functional Interfaces (IFG) of KIT, explains. First, light is absorbed in a photoactive material. Single electrons are removed from their site and leave a hole there. The electron-hole pairs are stable for a short term only. Then, they either decay under the emission of light or are separated into an electron and a hole that move in the material independently of each other. The fate of this charged particle then depends on the material. In most materials, free holes are not stable, but converted into so-called polarons under energy loss. A polaron is a special pseudoparticle composed of a particle and its interaction with the environment. The polarons formed are stable for a longer term and travel through the photoactive material until they are converted into electrical or chemical energy at an interface. 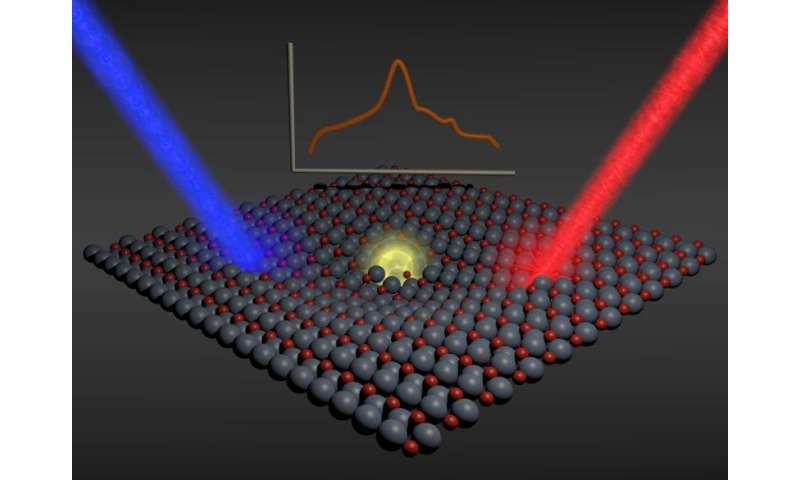 Researchers of KIT under the direction of Professor Christof Wöll have now carried out experiments using photoactive zinc oxide material in order to study the formation and migration of polarons. They employed a worldwide unique experimental setup for infrared reflection absorption spectroscopy (IRRAS) with a temporal resolution of 100 milliseconds and measured infrared spectra of zinc oxide monocrystals and observed intensive absorption bands, i.e. fingerprints, of a so far unknown pseudoparticle. Interpretation of the data and identification of this new particle were big challenges for the KIT scientists. In cooperation with a group working at the Fritz Haber Institute and the Excellence Center for Computational Nanoscience (COMP) of Aalto University, however, they succeeded in unambiguously allocating the absorption bands to so-called hole polarons. "This is an important finding made in 2015, the International Year of Light and Light-based Technologies," Professor Wöll says.